"Just a short note to thank you for the excellent service you kindly gave us on the occasion of our daughter’s wedding at Saint Margaret’s Church, Ditchling, on the 28th August 2009. In my role as a parish priest for over thirty years, I have encountered many wedding cars and their drivers and so it is with a degree of personal experience that I can say that your approach was first class. The wonderful care and attention that you showed to us set the scene for a truly memorable day. It is not surprising that you have “A” list celebrities using your services." "Andrew, I just wanted to say thank you for you great professionalism, help and support on the 9th of August. We all thought you were brilliant and your presence was a great comfort and help to us at a fairly tense - if exciting - point of the day. And of course your car was beautiful! We will recommend you to all our engaged friends in Brighton." I just wanted to say thank you for chauffering me and my father to the church on my wedding day and then driving my new husband and I onto our reception at Newick Park. The car was absolutely stunning and now my dad wants one! I must also add the flowers you used were perfect - I've added a picture of the church archway flowers so you can see just how close they were to ours - I really appreciated that! Once again many thanks and rest assured if we ever need the service again we'll be straight to you (not for another wedding though!)" Thank you so much for the wonderful job you did chauffeuring us on our wedding day to South Lodge. The cars were lovely and you were very efficient and professional, yet friendy. You were definitely an expert at calming the nerves of Brides and Fathers! The little touches of bottled water, good for a dry throat, those superb drop down vanity mirrors, tissues and chilled champagne were lovely. We will never forget your words of wisdom...”any marks are not stains on your dress, they are memories!” It was lovely when you returned after reception to take us off to Gravetye Manor, it was the perfect end to the perfect day! Many thanks for your perfect service you provided on our wedding day. You made me feel very relaxed on the way to the church and then onwards to the hotel. You were very professional, yet friendly too and we are so pleased we chose you! Just a thank you note to say our Mercedes S-class wedding car was beautiful and thanks for everything you did for us. We will recommend you to family and friends and wish you all the best for the future." We just wanted to let you know that we were so pleased that Andrew was our chauffeur for our wedding day. The Mercedes was very comfy and smart and Andrew was very professional, with a great sense of humour that put everyone at ease. He was very prompt, courteous and professional. It was very helpful to us that you were able to take the Bridesmaids to church first. With our tight budget, that saved us having two cars! We most certainly will be recommending these services to friends and family. "Your package that served us chilled champagne after the service was just what we needed! You even chilled the crystal flutes, such detail. When I said we didn’t need a wedding car because we were having it all at the hotel, you persuaded me we would need your Mercedes S-Class for the departure confetti photoshoot and a chilled champagne tour before returning back to the hotel. That was the only 20 minutes I saw of my new wife all day! I did not realise how precious that time would be with my new wife, away from everyone." "Thank you so much for making our wedding day special. 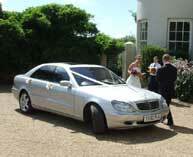 The wedding car was fantastic and the service you provided could not be bettered. Your prompt arrival, professional approach, kind words and champagne en-route, all added to our magical day. Thank you also for being so flexible when we were leaving at the end of the day, as everyone wanted to give us a proper send off! I will try to send you some photos and if you need a recommendation, please don’t hesitate to ask me, I’d be happy to do so. Thanks again Andrew." Thank you so much for your expertise in sorting the crisis. Who would have thought you were a photographer as well as a chauffeur! When the photographer went from home to the reception venue and was not there at Herstmonceux Castle when we arrived for the service, I thought the all important Father and Bride pictures arriving at “church” were lost. But no, super Andrew was prepared and stepped in to take the photos, blooming marvellous. Anyone not booking you is mad! Thank you so much for taking us to the church. The wedding car was lovely and very relaxing. We had an amazing day with lots of lovely memories to treasure and would certainly recommend you to anyone. Thanks again. Thank you for Saturday, you were charming and helped to make it the most perfect day. I would like to thank you for the Mercedes provided to take my son and his new wife to their hotel after the reception. They really appreciated it and it was the perfect end to a fantastic day.